This morning from one authentic source I have learned about the current road violence of Bangladesh. Hope that this situation will be improved soon as this is related to our children’s life. Here I am narrating a voice of a Bangladeshi youth about the current road killing and youth resistance. “Bangladesh! A country where law-makers prohibit teachers by saying lay a hand on students meanwhile the POLICE does their own job! How a student’s life could be safe when a ridicule and evil plan against the teenagers is visible. It has been long four days and almost every student of school and college have come to protest against the current radical violence. What happened basically? Four days ago a city bus ran over the students of ‘ Shaheed Ramiz Uddin Cantonment College’ while the bus was competing with the other bus. This is a common scenario in Dhaka city we all know. People of Dhaka city are used to with this vicious transport system, bus drivers and their associates’ ill manners, and their ignorance. In the morning school and office hours, the two buses were competing in a speed race midst the city and the incident happened to like other incidents which were happening on a regular basis. Two students named Dia Khanam and Abdul Karim Rajib have been killed right away on the spot and unfortunately, another five life were included to receive death certificates sooner. A minister of Bangladesh Mr. Shajahan Khan have been asked upon on the issue and he replied ” 33 people died in India currently but no one is saying a word. So why you react this way? And he dismissed this critical issue with a laughter as if nothing happened and students or public’s life really does not matter to him or his government. But NO! We must not make a mistake of thinking that this is just an isolated incident. This kind of violence, injuries, and road killings are occurring every day in Bangladesh yet the minister Mr. Shajahan Khan laughed so callously in an impolite manner. He did not show his mercy on the high school students’ death at all; rather, he was reluctant about the casualty, painful death of teenagers. However, on the very day of incident students of Shaheed Ramiz Uddin School came out on the road and out of anger and frustration, they wrecked a number of buses. Their protest has been followed on, the day after by the mass students. At least students of five colleges joined in this resistance. But this resistance was demonstrated in a peaceful manner. They were not involved in any vandalism; rather, these teenagers were calm and came up with plans and ideas on how to create a mass resistance and teach government how to run the city transport system. They created blockades in many places of the Capital City of Dhaka. 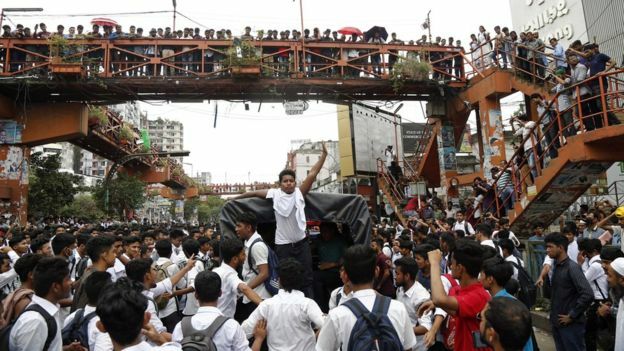 It was miserable to see after the death of high school students, Bangladesh government could not come up with a good plan immediately; rather, the police force tried to take control on students in a brutal manner. The next day, students of Shaheed Police Smrity College joined in the protest but they were beaten up inhumanely by the Bangladesh police force. The ferocity of Bangladesh police force is also known, their cruelty fueled teenagers to evolve mass resistance in Dhaka City. Almost every student of every college of Dhaka city, who are largely teenagers, the high school grades, they came out on the road to protest against the radical violence of reckless and brutal Bangladeshi drivers’ community, Bangladesh Police force’s savagery and aggressiveness, and the current government’s indifference on this crucial issue. A number of school and colleges joined in this student movement. Among the students of ‘Government Science College’, ‘BAF Shaheen College’, ‘Dhaka College’, ‘Dhaka City College’, ‘BCIC College’, ‘Notre Dame College’, ‘ Motijheel Ideal College’ and many more. They took over the major streets of Dhaka City and took part in the traffic polices to commute the transport in order and safe manner. Some parents, mothers and a few teachers came out and stayed on the street to ensure students’ safety, and they provided food and water. However, these students are now in danger for school authority and government’s police force. Despite the fact of students’ peaceful demonstration for a good cause, each college authority is threatening these students as they could be expelled at any moment from the college. It raises a question, then, what they have been doing all these days? For what? Why they raised their voice and took control on Dhaka roads and transportations. Just wrecking things and for vandalism? Absolutely not! Rather, they showed how to take responsibility and do the duty properly. These teenagers checked the license of every vehicle in the city and it is surprising that they made it exemplary how a better way city traffics can work though there are not enough express roads or over bridges in the city. They shaped the traffic such a great way, so vehicles and city life can be much safer what was totally absent in the usual traffic control system of Bangladesh. It was remarkable and interesting to watch how these teenagers created Dhaka traffic rules and they showed their compassion to patients and sick travelers. They let pass every single ambulances or case of emergency without any hesitation and cleaned the city road swiping by themselves. Although people have been suffering for lack of public transport at this moment as this small city is not ready to take the load of the huge population. Although in terms of justice and proper punishment of the culprits still, the government seemed pale and voiceless. Today, Bangladesh Prime Minister donated 20 lakh taka for each student’s death, the two victims’ family. Can we measure one student’s life is worth 20 lakh taka? Id that all we can do? This is crucial as a political party named ‘Chatro-League’ and police beat the protesters ruthlessly and even shot bullets, which was noted by the youth and journalists already. Especially in Mirpur area heavy causalities occurred by the so-called political party, this should be taken care of by the government quickly for her own reputation. The youth groups are standing behind nothing but these words: ‘We want justice’ Yes! That is true, we really want justice! After the narratives from the field, I would like to recommend a few things so Dhaka road can be safer in the future. As we know, the Greater Dhaka Area is crowded, it has a population of over 18 million as of 2016, while the city itself has a population estimated at about 8.5 million. Dhaka is one of the most densely populated cities in the world. The city consists with a density of 23,234 people per square kilometer within a total area of 300 square kilometers, which made city life miserable. Thus there is a need for a number of express lanes in the capital city. And there should be time billboard and markers on the road for the heavy trucks and buses, visible billboards for approaching each school and signs of speed limit 20 miles in front of each school. In residential area speed limit should be 40 and in the busy area of the city not more than 50-60. Otherwise, 30,000 to 50,000 taka fine for breaking any of these rules. On the top of, need to educate drivers providing 1-month intense lessons on safe driving and redesign the driving license system to make the driving license certificate tougher as West, as it is related to our children’s life. One important task must be done, the city’s administrative buildings, universities and other social institutions could be moved from the Capital. If administrative offices and jobs can be decentralized, it will help to reduce the population of Dhaka city. Many administrative buildings and private universities could be moved to the suburban area or in another district such as Mymensingh or Brahmanbaria. So pull factors of migration to Dhaka city can be stopped. Though we cannot compare Bangladesh with a Western country I am mentioning here as I feel it can be possible through the country is small. Canada has one of the most decentralized governments in the world. The capital city Ottawa is not overburdened for its decentralization role. This is not only a wakeup call for the drivers. This is a call for the Bangladeshi politicians, leaders, reformists, and intellectuals. 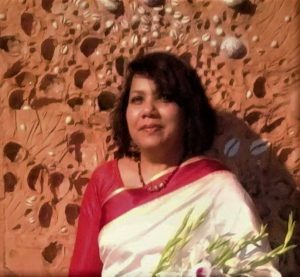 However, this is not a daunting task for Bangladesh government only needs her good will and enough effort as she wants to see her children are safe.